By now we’re well aware that McDonald’s has struggled to attract and keep new customers in recent years, leading to an all-out overhaul of the fast-food powerhouse. The Golden Arches’ trouble is perhaps most evident this week, as the company clocked in dead last among competition in the American Customer Satisfaction Index, yet again. 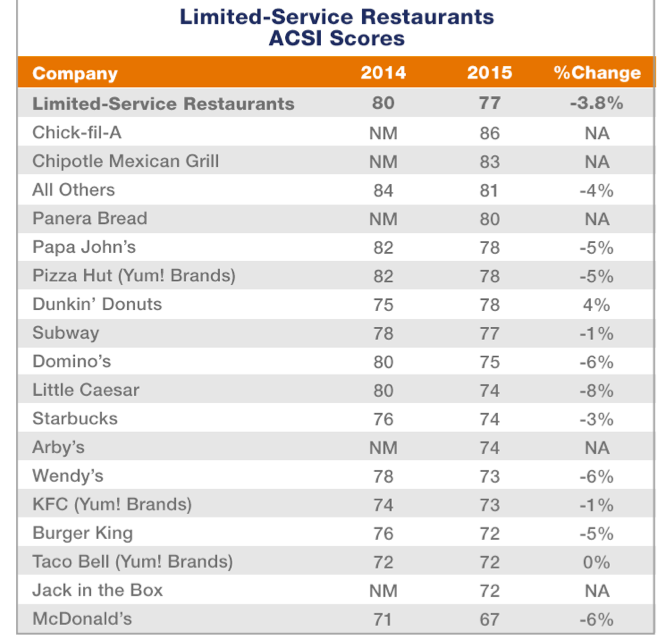 The ACSI recently unveiled its annual Full-Service Limited-Service Restaurant ratings [PDF], which compares a dozen name-brand burger, sandwich, pizza, and coffee chains, as well as sit-down dining establishments. For the sixth year in a row, and the 19th time in 20 surveys, the iconic fast food restaurant brought up the rear with a score of 67 — three points below its score last year, and 19 points below new leader Chick-fil-A. Speaking of Chick-fil-A, the company had a strong showing in its debut in the ACSI ratings, tallying a rating of 86, the highest ever score by a company in the quick-service category. The restaurant wasn’t the only first-timer to the report to have an impressive showing: Chipotle ranked second with a score of 83, while Panera came in third with a score of 80. Other newbies, Arby’s and Jack In The Box, didn’t benefit quite as well as their fellow rookies, scoring 74 and 72, respectively. Last year’s leaders, Papa John’s and Pizza Hut, both shed several points this year, each scoring 78 points. In fact, nearly all of the restaurants named in the survey saw a drop from their previous rating, with Little Caeser’s 7% drop from 80 to 74 being the worst. Domino’s, Wendy’s, Burger King and McDonald’s each faced a significant drop of at least 5%. The only establishment to improve in rankings this year was Dunkin’ Donuts, with an increase of 4% from 75 to 78. 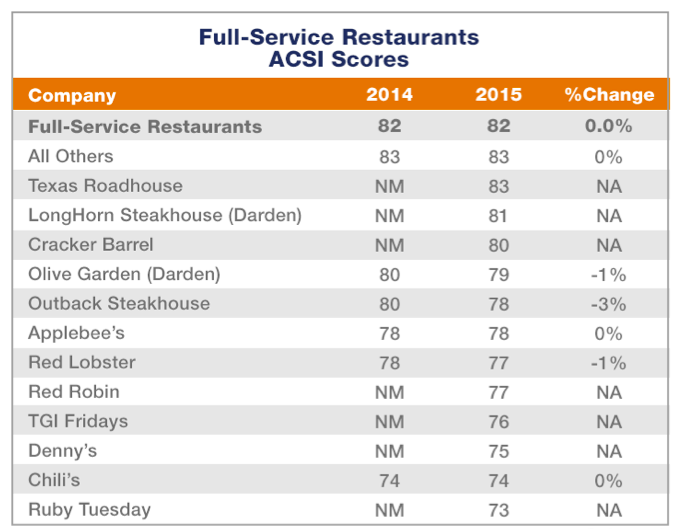 Full-service restaurants tended to fare better in the ACSI rankings, with the lowest score — belonging to Ruby Tuesdays — coming in at just 73 points. Once again, a new entrant took top billing, with Texas Roadhouse rating an 83. Rounding out the top 5 (which included one tie) is LongHorn Steakhouse (81), Cracker Barrel (80), Olive Garden (79) and Outback Steakhouse and Applebee’s (78).